Bloom Time & Color: Dianthus have single or double blooms that can last through spring, summer and fall. 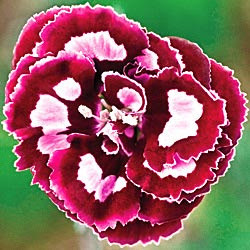 Most Dianthus have pink blooms with white, red or cream colored accents. Dimensions: Dianthus can grow anywhere between 6"-36" tall and wide. See specific species and cultivars at the bottom of this article for details. Maintenance: Do not mulch all the way around the Dianthus or you will encourage stem rot. Clumps can be divided every 2 or 3 years to encourage better flower production. Snipping blooms off for cut flower arrangements, or deadheading faded blooms will encourage better flower production.